If your child is afraid of the dentist, they’re not alone! Kids often don’t know what to expect, so it can be scary. Thankfully, they don’t have to stay scared. 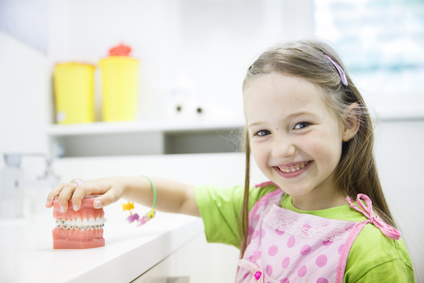 Try using some of these tips to get your kids comfortable with their dentist. The earlier you get your child to the dentist, the better. The American Dental Association recommends bringing your little one in for kids dental services by their first birthday or whenever the first tooth emerges. At such a young age, children don’t have the hesitation and fear that older kids might, allowing them the chance to get comfortable with the dentist. Keeping regular appointments will ensure that they become familiar with the process, helping to ease their fears. While most adults don’t love going to the dentist, make sure your child doesn’t know that! If mommy is terrified of going to the dentist herself, junior isn’t going to be too keen on going either. Instead of discussing your fears, make sure to talk to your child about how you’re looking forward to going to the dentist. Emphasize how much you love to have nice, clean teeth. You could even bring your child to your next cleaning. That way, they can see the whole process and watch their parent happily receive their treatment. Being a good example also extends to home dental care. Practice good hygiene at home – and make sure your kids see it happening! Much of your child’s fear about the dentist revolves around not knowing what to expect. Oftentimes, what we can imagine is far worse than reality. Instead of letting your child’s imagination run away with them, explain what kids dental services look like. You can do this in a variety of ways. There are many books and movies available about going to the dentist, often with your child’s favorite cartoon character. These are even better, since your child will be able to see a character they love experiencing the dentist and coming out okay. Another way is to role play. Set up a pretend dentist’s chair and play “dentist office,” that way you can walk your child through the process with play. You pretend to be the dentist and look in their mouth, count their teeth, and brush if you can. It might even help for them to take a turn being the dentist. If your child has a favorite stuffed animal or blanket, it can help to bring them to the dentist. If the stuffed animal has “teeth,” it can be extra helpful, as the dentist can take care of its teeth first. If your child is really nervous, your dentist might be okay with you putting a movie on a handheld device. This is a huge distraction and can help them sit still. The more your child goes to the dentist, the more comfortable they’ll be. Using these tips and a little time, your child will be unafraid in no time.